I saw Brad Bird‘s feature debut, The Iron Giant, at the time of its release in 1999 in a mostly empty theater at the old AMC Century City 14 in Los Angeles. It was a brilliant film largely ignored at the time. Bird went on to direct The Incredibles and Mission: Impossible – Ghost Protocol. There was a special edition DVD release of the film, featuring a commentary composed mostly of Bird thanking his incredible staff for making a film that was so special and so very different from most of the animated movies released at the time. 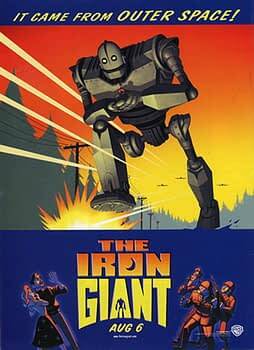 The AMC theater no longer exists, replaced with a much better facility, but The Iron Giant lives on, especially as the film will return to theaters on September 30th with new scenes. Yahoo! Movies also confirms a Blu-ray release is on the way, which is long overdue for a film that deserved 1080p resolution the second the format crystallized. I’m glad the film found an audience and is now considered a worthy enough asset for new scenes and a Blu-ray release. I truly love this film, but I think I’ll save my thoughts for a review of the Blu-ray release come the Fall. Update – According to Warner Bros, no officially announcement of the Blu-ray release has been made but it will not be in 2015.